…and then, of course, there’s weight loss, which is absolutely nothing like this at all. People who have told you that it is are likely the ones you’ve seriously considered punching in the face (and may have even pre-calculated how many calories you’d burn doing it). In reality, when it comes to women’s weight loss, you aren’t clinging nostalgically to those no-longer-so-stretchy stretch pants with the worn-out waist band, faded backside and thigh seams that are coming apart. You aren’t snapping slideshow selfies of yourself leaning sideways and lifting your heels off of the bathroom scale in one last desperate attempt to see some weight loss progress. You just want to get there. You want to get there now. You want to do is healthily. You want to do it safely. But you want to do it, and you want it to happen fast, efficiently and effectively. Nobody wants to take the longest and most complicated route to get to the place they really want to be. That’s just the honest truth – why should we have to hide this or feel judged for telling it like it is? You told us what you really want, and we’ve been listening: You want healthy, safe, natural and pure weight loss supplements that will get you there faster, and more conveniently, efficiently and effectively than dieting alone. That’s just the reality. And we hear you. So we came up with New SLIMQUICK® Pure Weight-Loss Protein, designed for Women to give you exactly that. Like all of our SLIMQUICK® products, this revolutionary protein powder was designed with women specifically in mind – women’s unique health concerns, women’s weight loss and fat-burning mechanisms, women’s busy schedules, and women’s desire for high-quality, natural and safe products. 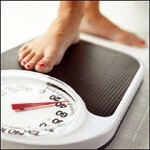 Most importantly, it’s designed for women’s no-nonsense sixth sense and demand for real results. That’s why New SLIMQUICK® Pure Weight-Loss Protein is like no other protein powder currently on the market. We took three of the most clinically effective, safe and active ingredients in current weight loss research – whey protein, BioPure Green Tea™ extracts, and fiber – and blended them all together to create a ground-breaking formula that allows women to lose 3 times the weight*, helping women reach their weight loss goals faster, more efficiently and more effectively. New SLIMQUICK® Pure Weight-Loss Protein is the only protein powder of its kind, containing three powerful ingredients that help women shred body fat in multiple ways, simultaneously. 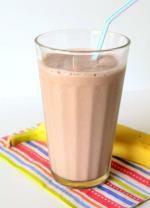 Whey protein, a natural protein found in milk, contains essential amino acids that play key roles in metabolism. These amino acids activate calorie burning just by eating them, and stimulate the break-down of fatty acids in your body. Studies also show that whey protein may satiate your appetite better than other types of protein, making you feel full faster and releasing intestinal hormones that signal you to stop eating. A growing number of studies continue to show that whey protein supplementation is linked to increased weight loss, as well as improved muscle tone and decreased levels of bad cholesterol. SLIMQUICK® Pure has also isolated the fat burning components of green tea that speed up your metabolism better than any unhealthy chemical ingredient. New SLIMQUICK® Pure Weight-Loss Protein with BioPure Green Tea™ allows for 3 times the absorption of fat burning agents called catechins, so that you can lose 3 times the weight*. Finally, fiber is nature’s way of keeping your blood sugar more stable, making you feel fuller longer, and keeping your digestive system working cleanly, efficiently, and geared to burning fat instead of storing it. 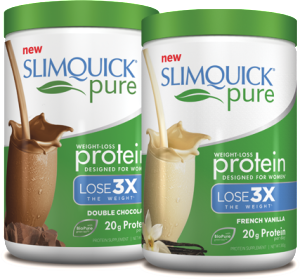 Only New SLIMQUICK® Pure Weight-Loss Protein contains 20 grams of whey protein, 6 grams of fiber and BioPure Green Tea™ extracts, clinically proven to help overweight women lose 3 times the weight versus dieting alone*, in just 13 weeks! You were honest about what you wanted, and so we give you New SLIMQUICK® Pure Weight-Loss Protein, designed for Women, to help you lose weight safely, faster, and more effectively than dieting alone or other leading protein powders on the market. And in the spirit of honest women, we also made sure that it came in two fantastically delicious flavors – Double Chocolate and French Vanilla – because what’s the point of a weight loss quickie if it isn’t a bit fun too, right?! 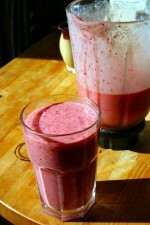 With a natural active weight-loss ingredient, it’s not your average protein shake. *A clinical study has shown that overweight women using SLIMQUICK® Pure’s key ingredient, along with a 1,350 calorie diet, lost 25 pounds versus 8 pounds with diet alone in just 13 weeks. These statements have not been evaluated by the Food and Drug Administration. These products are not intended to diagnose, treat, cure or prevent any disease. The logos and other marks on this website including SLIMQUICK® are protected by trademark law and may not be used without written consent. ©2014. All rights reserved. is this product safe for people overweight that are also on a doctor prescription for high blood pressure?? Please contact your health care practitioner before starting the SLIMQUICK Pure program. Check your local Walmart. They have been flying off the shelves so hopefully they are in stock! Can the powder be consumed differently than directed on the bottle? In other words, can it be mixed with milk, fruit, etc to make a smoothie? Or blended with ice? Can a 17 year use this? Is there a lot of sugar in this product of so how much? Our product pages include supplement information. For more information please email info@myslimquick.com. it says to take the slim quick berry drink mix 4x a day after the first 2 days , that’s 500mg of caffeine which isn’t very safe , can I just consume it 2x per day instead of 4x ???? will I still see weight loss results ? Hey, great question. It is okay to consume less than 4 packets a day. You can drink just two or you can drink 3, 2 in the morning and 1 midday. The only thing we do not advise is exceeding the maximum of four packets a day. We do not recommend using any other caffeinated products while using Slimquick products that contain caffeine. Do i have to take the second drink exactly 6 hours after the first? does it matter how long i wait before i take them in between time? You can take it after longer than 6 hours later if you choose to but not earlier. Remember the drink mix does contain caffeine so you don’t want to take it within 5 hours of when you go to bed.